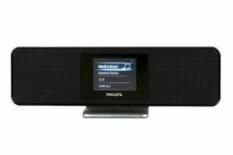 Philips NP2900 review | What Hi-Fi? This addition to the Philips Streamium range is the Keira Knightley of network media players: pretty, petite and classy. Unlike Ms Knightley (probably), it's also wall-mountable and has a lovely full-colour screen. Turn it on and it will quickly connect to your network via its wireless antenna or Ethernet port. If you use Windows Media Player on your PC, the Streamium will immediately be able to play all your shared music; if not, the excellent TwonkyMedia software is bundled and once installed will handle all the server functions. When we said the NP2900 will play all your music, we should have added the caveat, 'as long as your music's in the right format'. Compressed formats like WMA, AAC and MP3 are covered, but the only lossless codec that'll work is FLAC, which neither iTunes nor WMP will rip into. We reckon WAV should be covered at the very least. It's also worth noting that the only online music service the NP2900 can access is standard internet radio, while rivals like the Squeezebox Boom are compatible with Last.fm and Napster. Play some tunes and the Philips is very decent, though. In standard mode you get a direct but narrow delivery, while LivingSound mode adds two rear-firing drivers to create a big soundstage for such a small unit. There's good weight and vocal clarity, and though there's some hardness in the treble, it's not enough to put us off this stylish little player.